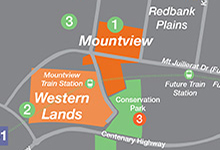 The houses and land for sale at Mountview in Redbank Plains are ideally positioned. 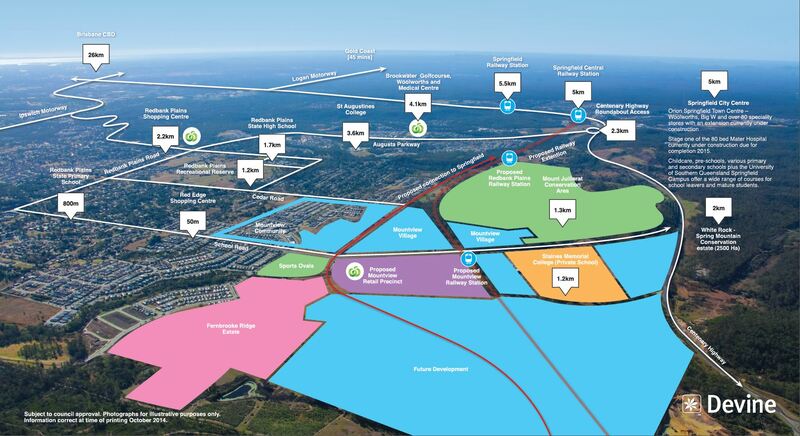 Located 30 kilometres west of Brisbane’s CBD, or 15 minutes from Ipswich and the new city of Springfield, families buying in this lifestyle community will have shops, businesses, transport, sport and educational facilities, conveniently close by. Mountview is also strategically placed within a prosperous metropolitan region. The Western Corridor is renowned for its continual economic and cultural growth sustained by an expanding population, vigorous State Government investment and ongoing business opportunities. In fact, Mountview at Redbank Plains, under the local governance of Ipswich City, could not be better placed for families. The area is set to benefit from The Ipswich 2020 & Beyond Plan, one of the largest per capita capital growth development programs being undertaken in Australia. In government investment, around $107 billion has been committed to infrastructure. This includes upgrades to the Ipswich Motorway to improve travel times, as well as access to the greater Brisbane area and the Gold Coast. There is also a $475 million rail line extension from Richlands to Springfield, due for completion in late 2013. 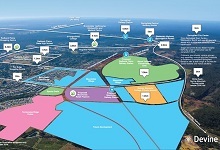 Even local industry is expanding with two projects, the Swanbank Enterprise Park and Ipswich Business Park, currently underway. Families here have access to childcare facilities, schools and tertiary education including The University of Southern Queensland and Bremer Institute of TAFE. 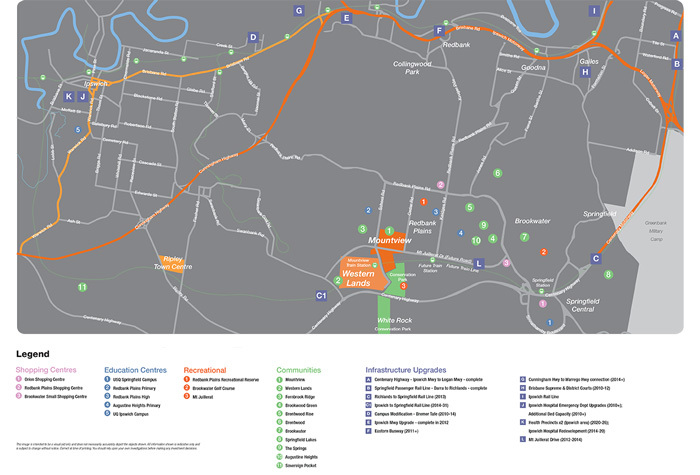 The University of Queensland’s Ipswich Campus is also located near Mountview Community and all are accessible by public transport. For the adults, there is the award-winning Brookwater Golf & Country Club, considered to be a premier recreational venue in our state's south east. Located in the ever serene White Rock-Spring Mountain Conservation Estate within easy reach of Brisbane, Ipswich and the Gold Coast, Mountview offers your family a great lifestyle. 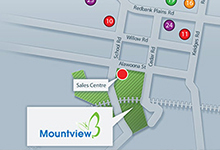 For all these reasons and more, Mountview at Redbank Plains is a much sought-after address. 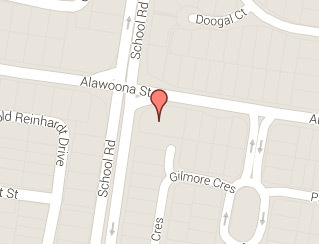 Mountview is a quality land release in the South East Queensland locality of Redbank Plains. Just over 30 minutes west of Brisbane's CBD and 15 minutes from Ipswich. 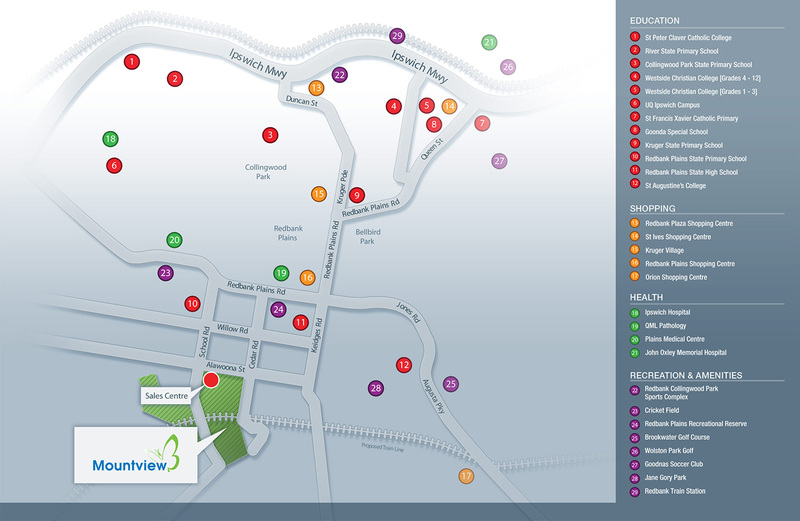 At Mountview you've got space to live life while still being close to major shopping, education, recreation and transport facilities. In-fact being so close to Ipswich, with the exceptional Ipswich Motorway connection to Brisbane and easy access to the Gold Coast you’ll have the greater South East region on your doorstep. The new city of Springfield and the award-winning Brookwater golf community are also just a short drive away. 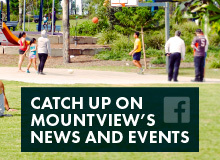 If you are looking for some of Queensland’s best value home and land packages, look no further than Mountview. Identified as a key area of growth, it's easy to see why so many people are rellocating to Redbank Plains. ^Great Start Grant provided by Queensland Government to eligible first home buyers only. Photographs and images are for illustrative purposes only. Information subject to change without notice.